Joan Mbogo is a beautician who has over the years struggled to love the skin she bears. As a child, Ms Mbogo suffered severe burns after falling in hot water. It got worse for Mbogo in her teens years when she started noticing white spots on her lips. After a misdiagnosis, the spots continued to spread until she was diagnosed with Vitiligo, a long-term condition caused by the lack of melanin where pale white patches develop on the skin. 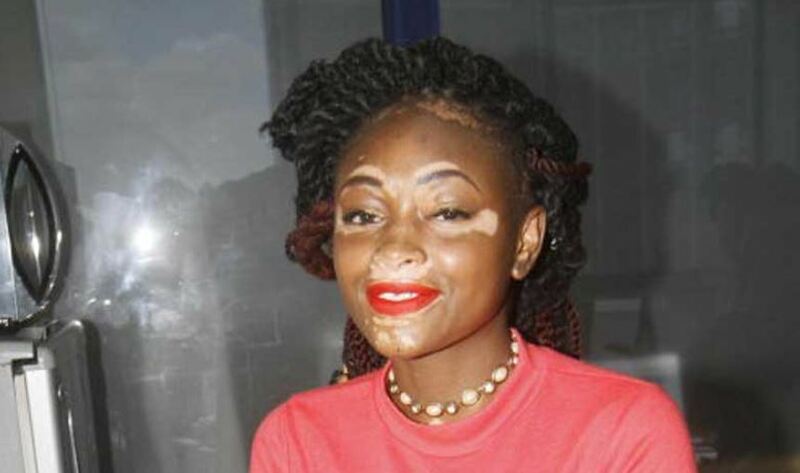 According to Mbogo, having vitiligo is a burden she has to carry every day especially in a society that knows nothing about the condition. 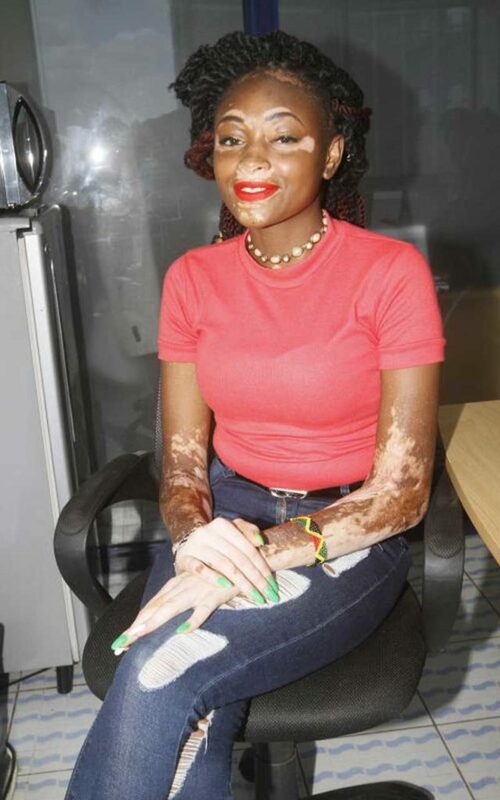 Coupled with her burn scars, Ms Mbogo has not had it easy; some of her family members claimed she was cursed, she got depressed and even attempted suicide. The doctors then were against the idea of skin grafting since I was very tiny. My parents were stuck with the option of numerous visits to health facilities where my wounds were nursed. It took a while to straighten my hands but they eventually healed. Unfortunately, the medicine applied on my wounds peeled off the skin and this left me with scars on my hands, chest and legs. As I grew up, I found it hard to endure people’s stares and I adopted the habit of wearing up to three sweaters even in hot weather. When I joined high school at 13, I started noticing white spots on my lips, but I didn’t make much of it. The following year, I visited chemist shops where I was given medication without a proper diagnosis. But the spots continued spreading. Soon, the spots had spread to my hands and chest. I visited a clinic where medical tests revealed that I was suffering from vitiligo. Doctors explained to me that vitiligo was a disease of the skin that resulted into patches on some parts of the skin. By this time, I was battling with self-esteem issues. I was always explaining to one person or other why my skin was the way it was. At home, some family members concluded that I was cursed. This is when depression set in and I started contemplating suicide. I have actually tried committing suicide. But the prying abated when I joined college to study Fashion and Beauty. I had always been passionate about beauty. I enjoyed watching models and started strutting at a young age. I learnt to accept my body when I was in college. I also learnt to maintain a positive attitude. I applied medicine on my hands and scalp and stayed out in the sun for 30 minutes. After that, I would stay indoors for the better part of the day. It was a requirement for the medicine to work. I eventually stopped applying the medication when I realised it wasn’t working. But much as I try to accept myself and do the things I am passionate about, obstacles stand in the way. Having vitiligo is a burden I have to carry every day especially in a society that knows nothing about the condition. Being a beautician with my condition is very challenging. Some clients avoid me. I guess they think I can infect them. There is need for people to understand that vitiligo can’t be transmitted. I have also been dismissed when I showed up for modeling contests. I have had judges who have told me that to be a model, one must have unblemished skin. I just wish the rule could be amended to include people with vitiligo. That said, I am glad to have a strong support network of family and a small circle of friends. I drew huge inspiration from Ruth Matete, who in a Facebook post, described how special she felt about scars she has always had from her childhood burn wounds. My spirit was even heightened when she talked to me and shared my experience with her virtual friends whose positive gave me a lot of inspiration.